Can Twitter, Inc. Keep Up Its User Growth? Better yet: Can Twitter's user growth accelerate? Investors following Twitter (NYSE:TWTR) stock during the past few years know how important user growth is to the company's business. As user growth slowed in 2014 and even turned negative for a short period in 2015, revenue growth quickly decelerated, and the stock plummeted. Investors questioned whether the social network will be forever limited to a small segment of the mass-market platforms enjoyed by juggernauts like Facebook (NASDAQ:FB) and Facebook's WhatsApp, Messenger, and Instagram. The trajectory of Twitter's users has not only rebounded, but the social network's user count is also reaching all-time highs, hitting 317 million in the company's most recent quarter. Can the company keep up this return to user growth? Twitter headquarters. Photo by Tim Trueman for Twitter. User growth was a bright spot for Twitter in its third quarter -- at least compared to its user growth in the past four quarters. Between Twitter's third quarter of 2015 and its second quarter of 2016, its monthly active users only increased from 307 million to 313 million, averaging just 0.7% sequential growth each quarter. But in the company's third quarter, Twitter's monthly active users increased 1.3% sequentially and 3% year over year to 317 million -- better, but still not great. Still, Twitter's recent return to more meaningful user growth isn't exactly the sort of growth that should have investors excited. For comparison, Facebook's monthly active users increased from 1,712 million to 1,788 million between the Q2 and Q3, representing 4.4% sequential growth. In addition, Facebook's third-quarter monthly active user count was up 16% year over year. And Twitter's user growth looks even less impressive when the social network is measured up against Facebook's Instagram. The photo- and video-sharing app has seen its monthly active users skyrocket from 500 million to 600 million in just six months. The point is, it's good Twitter has returned to user growth. But unless Twitter's user growth can accelerate further, there's still reason for investors to be concerned. With anemic growth like this, Twitter doesn't look like the mass-market social network founder and CEO Jack Dorsey says Twitter is. Management expects its audience to continue to grow, primarily driven by increased discipline in product discipline. This is important, of course, as audience growth should serve as a revenue driver -- and management seems to agree that these two items are correlated. "We believe that, with continued disciplined execution, growth in audience and engagement will drive acceleration in revenue growth over time," Twitter management said in the company's most recent shareholder letter. By tying revenue growth potential to audience growth potential, management is highlighting why audience growth is so important to Twitter as a company right now. Recently, revenue growth has slowed significantly, raising the stakes for the company to return to user growth so that it can reinvigorate a key revenue growth driver. 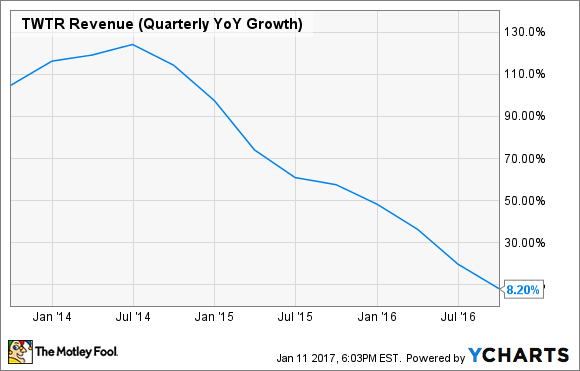 In Twitter's most recent quarter, revenue only increased 8% year over year. And analysts, on average, expect revenue will increase just 4% year over year in Q4. TWTR Revenue (Quarterly YoY Growth) data by YCharts. Simply put, without user growth, revenue growth won't come as easily. So, investors should be particularly interested in seeing Twitter's return to user growth continue -- and hopefully even accelerate. When Twitter reports fourth-quarter results on Feb. 9, investors will get another update on the important metric. How many monthly active users will Twitter hit? I'd look for around 322 million, representing about a 1.5% sequential increase -- a slight jump from the company's 1.3% sequential increase in monthly active users in Q3. Of course, investors shouldn't bank too much on this specific number; sometimes there are good reasons for fluctuations. But if the figure doesn't move as high as expected, investors should look for a very good reason for the underperformance.